My father Karl Gansovich Okkelman was Estonian. He was born in Leningrad in 1892. Finland forces of reaction provoked a Soviet-Finnish War in 1939 which ended with Finland defeat. My father was drafted into the army, went to the Finnish front-line, was wounded and sent to a military hospital in Omsk. He got married and stayed in Omsk after recovery. 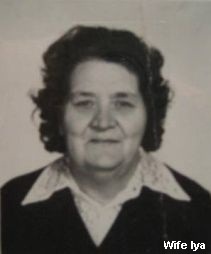 My mother Marina Trofimovna was born in 1902. She met my father after his recovery in hospital. I was born on 23rd of February, 1922. 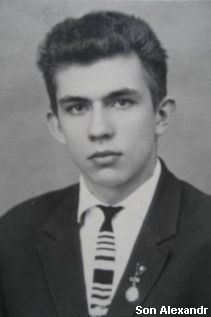 My brother Volodya was born in 1924, then my brother Igor was born in 1927, and later my sister Tamara in 1935. We did not have our own accommodation. This situation forced my parents to buy a land with dugout. Then they started to build our own house with the help of Omsk Railway Administration. While studying in general school, I took interest in small-arms target practice, first at school then in the Railman Club. After the 7th year at school I went to the sharpshooter school for my school vacations which was near Orel. I was sent to the Finnish front-line with other guys. Arrived at the point destination, I reported that I had come to war but heard in return: "You are too young, go home!" Which I did. It was 1938. However I did not find my home. My parents sold our house and went to Tashkent. But they could not settle there and returned. There was no enough money to reach Omsk so my parents were put down in Tyumen. They sent me a letter with their address in Tyumen and some money. I came to Tyumen, found my parents, brothers and my sister. I was late for school so I decided to find a job and then see what happens. My father worked as an accountant at the hospital near the city. We were given a house to live, my brothers went to school, and I started working at the factory producing window and garden frames. But soon my mother took my younger brother and sister Igor and Tamara and left for Omsk. Then my father announced that he was going to Omsk. I was left in Tyumen till my brother Volodya completed his school year, then I had to send Volodya to our parents to Omsk. But there was no word about me. My father left me with Volodya in care of the landlady till school vacations. After I had sent Volodya to Omsk to parents I stayed alone. Soon I was sacked from my job due to regular tardiness and absenteeism. What should I do? I had no money even to buy-out the rationed piece of bread. I slouched about whole days, mainly among market pick-pockets, and they taught to pick pocket and involved into their company. Once I picked old woman's pocket. She caught me, men surrounded me and beat to a mummy so that I recovered for about two weeks afterwards. I was thrown over the market fence and sat blooding in torn clothes there. I saw a man in a uniform coming to me. I thought that was a policeman. But that was a miracle. He wasn't a policeman, he was a pilot-instructor from an aeroclub, Vasily Kutergin. He was so nice to me that I honestly told him about all what had happened. He suggested that I should have gone with him and I agreed. We came to the aeroclub at the aerodrome. A doctor of the aeroclub cured all wounds. I took a shower, changed clothes, then I was given a lunch and put to sleep. I was appointed to a post of a night-watchman and a student-pilot at the aeroclub simultaneously. So thanks a million to this instructor. Thanks a million to other workers at the aeroclub who made a man out of me. I graduated from aeroclub in 1939. Then I was drafted into the army in the beginning of 1940 and sent serving in Omsk Pilot School which I finished in 1940. Further I was sent serving to Chita, the Zabaikalye Military Command. In the beginning of 1941 we flew to a landing ground and continued our flight trainings. But we were relocated for winterization soon. That was also announced that we should prepare to a long-distance flight which happened soon. We were summoned to Chita, took 9 High-Speed Bombers, selected 9 crews, and we were given a command to a long-distance flight. We had already heard a lot that Germany was going to attack us. But we flew to Balashov in the meanwhile. There was a suitable aerodrome and enough room for planes and crews. We started to prepare for battle. In several days after beginning of war we were given a task to bomb out a river crossing. We flew out to complete the task. Only I, my flight commander and air-squadron commander returned from the task. Other crews were crashed down, or were forced landing, either parachuted, but all of us returned to Balashov. Soon we were sent back to Chita. I was sent from Chita to Irkutsk to the plant which produced new aircrafts Pe-2. Then I became a transition training instructor for Pe-2. When the plant was relocated to Kazan, I moved there too. The Kazan plant started producing aircrafts Pe-2. There was a flying group of three air-squadrons at the grounds of the Kazan airport. I was in one of those air-squadrons. Our air-squadron based in a tent camp about 15 kilometers east from Kazan for summer. Our air-squadrons were provided with meteorologists to give weather forecast so that we could normally undergo flight trainings. 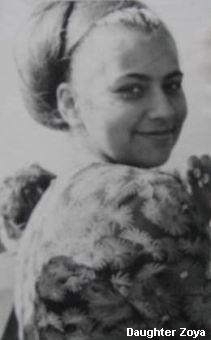 One of those meteorologists was Iya Kholmskaya who was drafted into the army after she had graduated from the Physico-Mathematics Department of Kazan State University. So I met Iya. We got married in autumn and our son Sasha was born soon. It was 1945. Our daughter Zoya was born in 1948. I quit the army in 1946. Later was a pilot at Chistopol Timepiece Products Factory where I worked from 1948 till 1955. During these 7 years at the Factory I received 109 awards, which means 16 awards each year. After aviation had been liquidated at the Factory, I was transferred to work at the Kazan Air Group. I arrived in Izhevsk in the position of air-squadron commander of the Kazan Air Group in 1958. There was no own aviation in Izhevsk that time. We started actively using aviation in national economy. In 1960 a reserve air-squadron of the Kazan Air Group was renamed into the 61st separate air-squadron under my direction and referred to the Ural department. I was discharged from the flight work due to health reasons in 1964 and appointed to the post of flight trainer instructor. I aviated and teach to aviate on the following aircrafts: Po-2, UT-2, R-5, Yak-12, An-2, SA-45, SB, Pe-2, Shcha-2. Izhevsk period of my work is described in the book "Ural Aviation: Time and People. 70 years of Ural Department of Civil Aviation". It is said that I participated in searching of a capsule with the dog Zvezdochka and a dummy spaceman on board of a space ship-satellite in the last flight before Yu.A.Gagarin's take-off. There is a monument in area of the space ship-satellite landing now, and there is also a monument to Zvezdochka in Izhevsk with my surname on it. In 1984 I went into retirement for health reasons and keep in touch with schools and museums at the moment.